There are some places that normal, average everyday people would never dare venture. Places like the Necropolis at Wati, sealed for millennia, its secrets locked away from prying eyes and all but the most foolhardy for all that time. All the treasure in the world wouldn’t tempt the rational or the sane to cross its threshold; but Ezren, Harsk, Valeros and Merisiel aren’t exactly normal and they’re not what you’d call sane. Having explored, and come face to face with the denizens of, the city of the dead in the previous instalment, our band of heroes find themselves caught in the midst of an undead invasion, as the power of the Forgotten Pharaoh’s is finally unleashed. 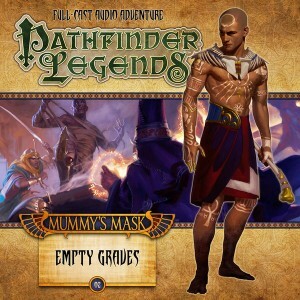 ‘Empty Graves’ is a maelstrom of zombies, mummies, dragons, kidnap, spirits and dark magic that culminates in a quest to find a way to save Wati from the army of the dead that the necromantic powers of the mask have summoned. Furiously paced, filled with lightning fast action and built around a plot that bobs and weaves like a highly trained prize-fighter, ‘Empty Graves’ plunges its audience right into the thick of things. Crazy as it sounds, and I know it sounds crazy, there are times when you feel like you’re there with the adventurers, standing shoulder to shoulder with them as they battle the creatures of the grave. Between spirits that guide the deceased to their eternal rest, reanimated heads and all manner of ghosts and ghouls, you’re transported to Wati, ducking as Harsk swings his axe at yet another rotting mummy.